There are few speeches as compelling as those emanating from women who can't speak much, or at all. We've already had a few of them here on Famous Speech Friday: Helen Keller, originally thought to be without speech, but who made a 50-year career of public speaking despite being profoundly deaf and blind. And former U.S. Representative Gabrielle Giffords, whose resignation from Congress after she was shot in the head had to be read by a colleague. Today you can see that I am alive. I can speak, I can see you, I can see everyone. It's just because of the prayers of people. Because all people — men, women, children — all of them have prayed for me. And because of all these prayers God has given me this new life. a second life. Her statement also touched on a vision of her future: "I want to serve. I want to serve the people. I want every girl, every child, to be educated. 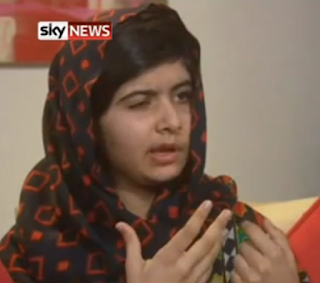 For that reason, we have organized the Malala Fund." In the video, her speech is clear, but the left side of her face is rigid. While she hasn't sustained any neurological dmaage, she has had surgery to reconstruct her skull and a cochlear implant to restore hearing in her left ear. You're unlikely to experience anything close to this--that's my hope for you. So what can you learn from this famous speech? It's even more important to speak when someone's tried to silence you: Malala uses public speaking to spread her cause and at 15 is already an accomplished speaker who uses inflection and gesture and emotion to put her points across. The shooting was a direct effort to silence her, so speaking again is more than just a medical and personal achievement. Anita Sarkeesian, a recent Famous Speech Friday speaker, faced a similar challenge when online hackers tried to silence her with harrassment. If you can bounce back and speak again after being silenced, your words will have even more power. Give us your unique voice in "I" statements: No one can make this statement but Malala, and that's underscored by her string of "I" statements. You can use the same tactic both to underscore your unique voice, and to avoid sounding accusatory with "you" statements when you've been under attack. The vertical pronoun lets her share her vision and take the high road at the same time. Don't forget your mission: If you had just 44 seconds, what would you manage to mention? Malala focuses on two things: Acknowledging the support and prayers that helped her recovery, and her mission to educate girls. It's economical, spare and on target, but she spends extra words to be sure that women and girls are mentioned. You can see some interviews with Malala talking about her mission, and view Malala giving an emotional speech in her own language in this moving video, too--it will give you a sense of how accomplished and moving a public speaker she has been, even as a teenager. Here's her first statement after having been shot. What do you think of this famous speech?